As we're fond of saying, you just can't make this stuff up. Today we're reporting two stories from the past few weeks that we would have taken for Purim spoofs if it weren't mid-January. A few days ago the Saudis "detained" a vulture that flew into their airspace with a leg tag saying "Tel Aviv University." The authorities claimed the vulture was sent by the Mossad to spy for Israel. If we were sending a bird to spy we certainly wouldn't put our return address on it, but when does logic apply in the Middle East? This report comes on the heels of another one last month that the Mossad was responsible for shark attacks in Egyptian waters. 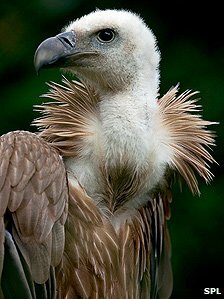 The griffon vulture was carrying a GPS transmitter bearing the name of Tel Aviv University, prompting rumours it was part of a Zionist plot. Israeli wildlife officials dismissed the claims as ludicrous and expressed concern about the bird's fate. The vulture, which can have a wing span of up to 265cm (8ft 8in), was caught after it landed in the desert city of Hyaal a few days ago. When locals discovered the GPS transmitter, they suspected the worst and handed it over to the security forces, said Israel's Ma'ariv newspaper. Conspiracy theories quickly began circulating in Saudi newspapers and on websites that the bird was involved in espionage. "The device does nothing more than receive and store basic data about the bird's whereabouts, and about his altitude and speed," a bird specialist at Israel's Park and Nature Authority told the newspaper. The data would be used to improve understanding of the endangered species' behaviour. "Now, this poor bird is paying a terrible price. That's very sad," said the unnamed expert. "I hope they release the poor thing." The vulture is the latest animal to be accused of being an unwitting Mossad operative. In December, the governor of Egypt's South Sinai province, Mohamed Abdul Fadil Shousha, suggested the spy agency may have had a hand in a string of deadly shark attacks off the coast of the Sharm el-Sheikh resort. The Israeli foreign ministry dismissed that allegation, saying the governor "must have seen Jaws one time too many, and confuses fact and fiction". Stephen Colbert, the host of Comedy Central's The Colbert Report, had a lot of fun reporting the Egyptian allegation, and we'll share it with you below, just after the serious report from Israel Television News. Truth is indeed stranger than fiction, and we hope you enjoy both videos.